Rick began playing guitar as a child, greatly influenced by the 1950’s records of his older brother. He discovered early on that the rock n’ roll music that he loved was really an evolution of blues. He then became fascinated by American “roots” music of all genres. By the age of 20, he was opening shows for such luminaries as Sonny Terry and Brownie McGee, John Hammond and Leon Redbone, as well as winning several fiddle and banjo contests in the Sierra foothills. 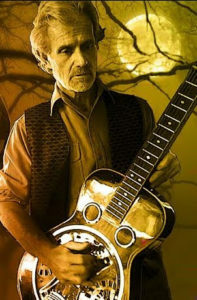 Rick currently plays with Page Brownton and the Mojo Navigators, an acoustic Americana trio. He also plays with Virgil Thrasher, a world class harmonica specialist, as well as performing as a soloist. Rick’s music is rich and varied, including all types of music from the 1920’s and 30’s, as well as contemporary Americana, Hawaiian and Celtic music.